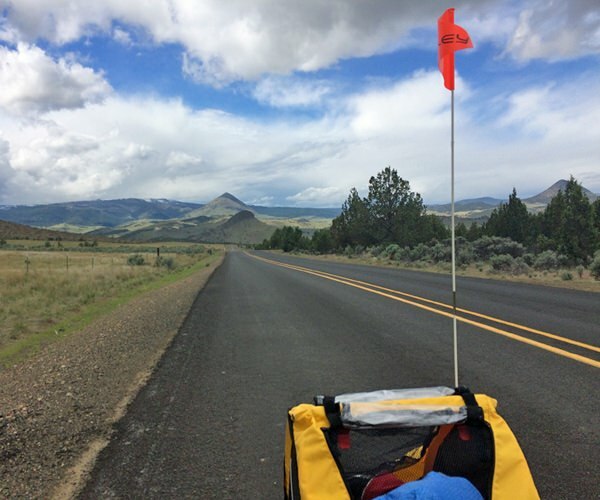 Whirring bicycle wheels and the steady gnawing of puppy teeth against a rawhide bone merge into a peaceful rhythm as I pedal down the two-lane highway, just a handful of miles outside Mitchell. 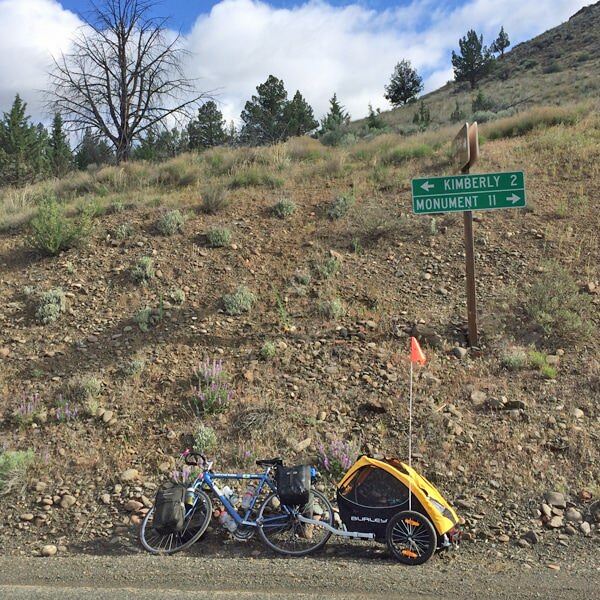 I’m exploring the Painted Hills Scenic Bikeway, Oregon’s newest addition to its official bicycle-friendly routes. 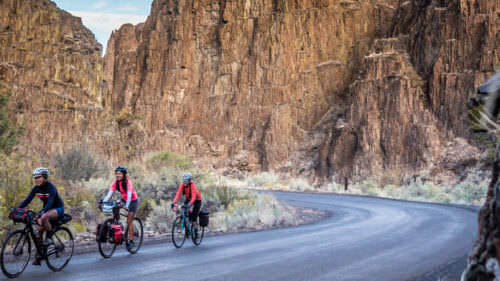 Located in Eastern Oregon, the state’s 15th Scenic Bikeway connects the three units of the John Day Fossil Beds National Monument over 161 miles and tops the state’s total bikeway network to more than 1,000 miles. To say the least, it’s a pretty big deal. 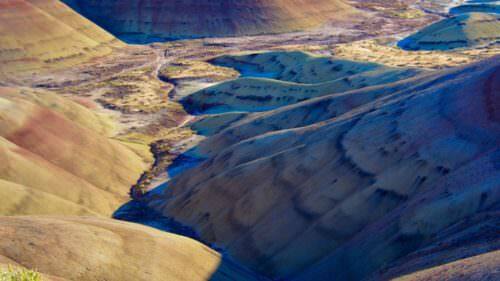 I drive from Bend to the Painted Hills at first light, arriving under heavy gray skies and intermittent rain. As I step out of the car and stretch my legs, the sun breaks through the clouds and lights up the red, gold and brown hues of the ancient soil on the hills. Riggins, my fluffy black-and-white border collie, watches from the backseat of the truck, eager to step out for a break, too. I leash him up and we take in the golden morning light in the empty park. I spot a ranger and let him know my plans for a three-day bike tour, inquiring about overnight parking. He hands me a more detailed map than the one I was carrying and suggests parking along the BLM land outside of the park, though I opt to park up the road in the town of Mitchell. As I unload my bike in front of the Mitchell post office, a woman approaches with a broom in hand. She is a postal worker sweeping the sidewalk in the morning sun, and she lets me know that I can park in the post office parking lot for the duration of my trip as long as I don’t block the mailbox. A man takes interest as I stuff a final few items into my panniers and begins asking questions about my plans. I learn that he’s on the committee for the Oregon Scenic Bikeways. 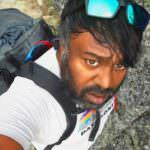 He introduces me to his wife and their dog and offers camping suggestions for my route. I can’t wait to get on the road. 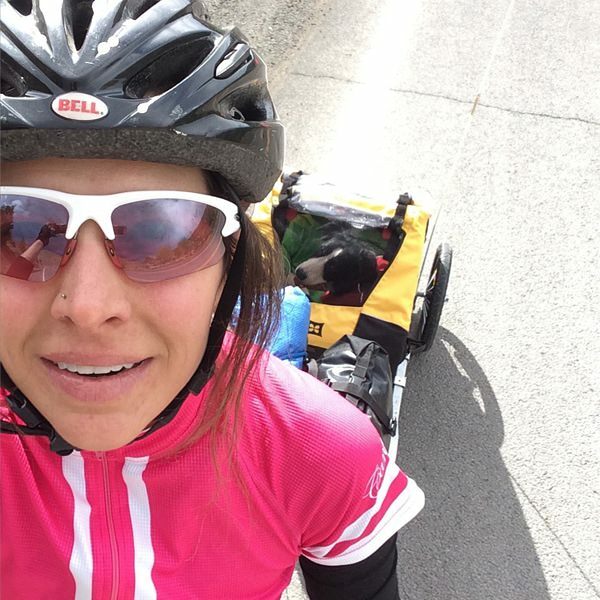 The route is hilly, beginning with a short, steep climb out of town onto a high prairie. I can see storm clouds in various states of precipitation surrounding me. For now though, the weather is dry and warm overhead. 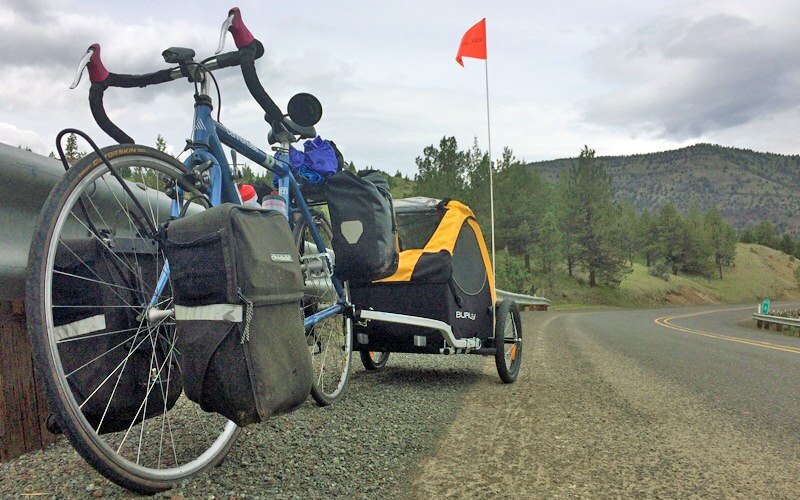 My road bike is loaded down with four panniers and I’m towing 47-pound Riggins in a Burley Tail Wagon. 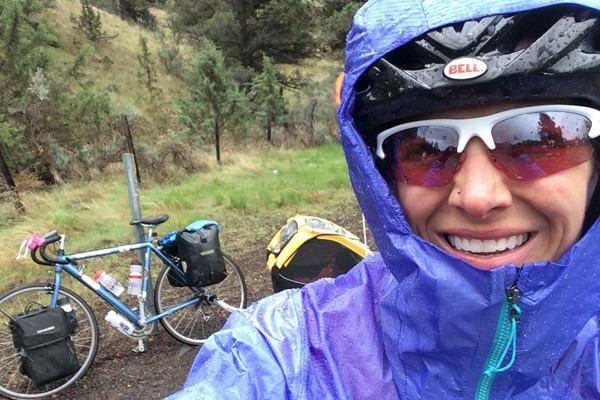 I packed food for three days, layers and rain gear in preparation for Eastern Oregon’s fickle weather and temperature swings, as well as enough water to make it about 25 miles to the John Day River, where I can refill with my water filter. 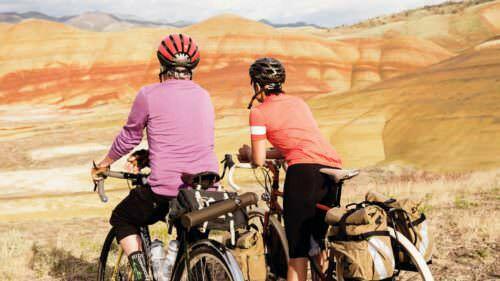 The Painted Hills Scenic Bikeway consists of a loop that crosses the John Day River and skirts the Sutton Mountain Wilderness Area. Branches of the bikeway extend out and back to Fossil, Mitchell and the Painted Hills and east along the John Day River to Kimberly. Parts of the Journey Through Time Scenic Byway overlap with the Painted Hills Scenic Bikeway. 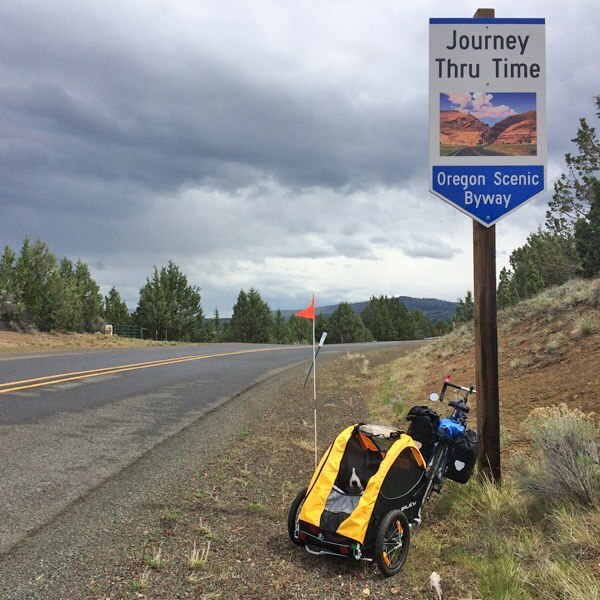 The 174-mile Old West Scenic Bikeway also passes through Kimberly; I ride the eastern side of the loop and then follow the John Day River to Spray and Kimberly, where I set up camp for the night at Lone Pine Campground (just east of Thomas Orchards on OR-402). My plan is to backtrack along the river and then loop back to Mitchell through the Sutton Mountain Wilderness Study Area, following almost the entire Painted Hills Scenic Bikeway route. OR-207 is quiet and the occasional traffic consists of local ranchers driving flatbed trucks, many with border collies or other ranching dogs on the back, slowing down, giving wide space and waving as they pass. After a few rolling miles, I spend most of the morning steadily climbing, gaining broad views of lush rolling farmland and craggy red bluffs before tapping my brakes on winding s-curves as I descend for a closer look. The notoriously unpredictable weather of the region hits with swirling black clouds overhead that pelt us with hail and occasional spitting rain, but for the most part it remains pleasant: sunny enough, warm enough and not too windy. 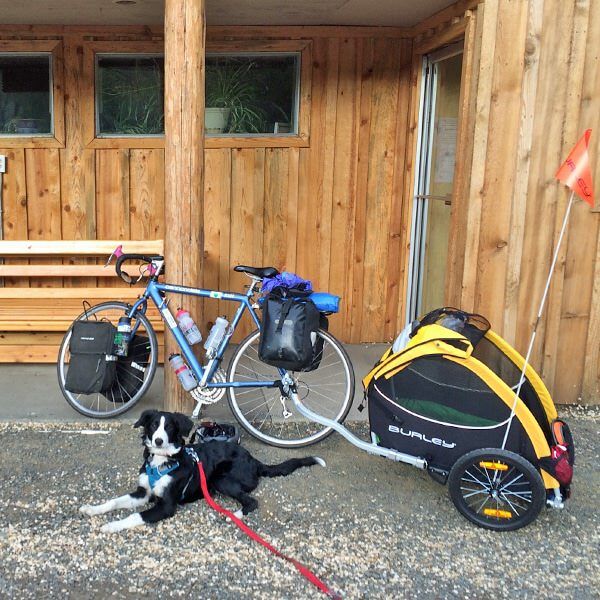 With the unusually heavy weight, I find myself pushing my bike up some of the hills in my bike cleats, and I even make Riggins get out of the Tail Wagon and walk beside me once or twice. After grinding out 52 miles with about 115 lbs attached to my bike, I make a tough decision to head back to Mitchell on my second day via Highway 26 (along Adventure Cycling’s U.S. Bicycle Routes network). It turns out to be only slightly fewer miles and a little less climbing, but it isn’t as steep and likely saves me miles of pushing my bike uphill. I underestimated the difficulty of pedaling these hilly roads with so much weight and the simple method of gearing down and grinding out pedal strokes is not quite enough on this particular trip — but I don’’t care. I have great company in the back of that little wagon. My spirits can not be dampened, even by hail. 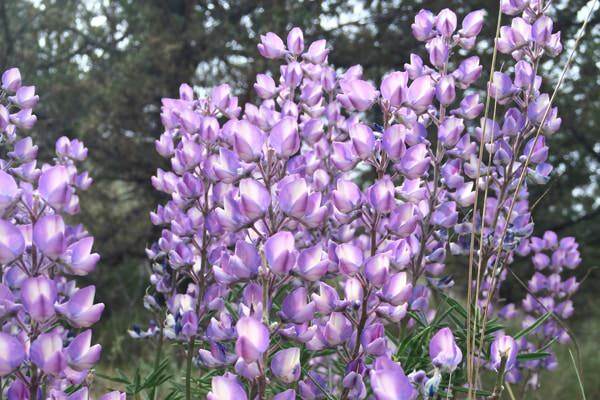 On the final descent to the river, lupine, desert paintbrush and wild sunflowers burst from the hillsides at every turn, making a colorful blur as I grip the brakes to control my speed. A bus filled with senior women from Sandy gives a friendly honk before passing, and we meet at the Service Creek rest stop and camping area at the bottom of the hill, next to the John Day River. The women dote on Riggins and ask me what I am doing, where I am going, whether I am certain that this is fun, and whether I need a ride. I laugh and assure them we are on an adventure, and yes, we are definitely having fun. After a short break, I let out a “Whoop!” as we depart the rest area, cross the bridge and turn upriver onto OR-19, back toward Spray and Kimberly. Allison Miles feels at home with dirt between her toes, snowflakes in her eyes and sweat dripping off her chin. 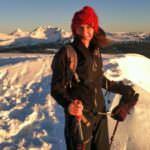 She tests her limits while exploring Oregon's wild and beautiful secrets, taking on crumbly volcanic peaks, remote trails and less-traveled ski lines.